I just met Sepehr at an ECEP planning meeting. Exciting to meet another CS Ed faculty in an Education school! He won the Yamashita Prize at Berkeley in 2015 for his STEM activism. Dr. Vakil’s research revolves around the intersection of equity and the teaching and learning of STEM, particularly in computer science and technology. This focus has led Dr. Vakil to conduct participatory design research projects in several contexts. These efforts include founding and directing the Oakland Science and Mathematics Outreach (OSMO) program—an after school program serving youth of color in the city of Oakland. Dr. Vakil also has experience teaching and conducting research within public schools. During graduate school, he co-taught Introductory Computer Science Courses for 3 years in the Oakland Unified and Berkeley Unified School Districts. As part of a university-research collaboration between UC Berkeley and the Oakland Unified School District, he worked with students and teachers in the Computer Science and Technology Academy at Oakland Technical High School to design an after school racial justice organization named SPOCN (Supporting People of Color Now!) Dr. Vakil’s work at the intersection of equity, STEM, and urban education has also led to publications in prestigious journals such as Cognition & Instruction, Equity and Excellence in Education, and the Journal of the Learning Sciences. I gave a keynote talk at VL/HCC 2015 (see the program here) on Tuesday morning. Here is the abstract, the short form outline, and a link to the slides on SlideShare.net. Abstract: We share a vision of a society that is able to express problems and ideas computationally. Andrea diSessa called that computational literacy, and he invented the Boxer Programming Environment to explore the media of computational literacy. Education has the job of making citizens literate. Education systems around the world are exploring the question of what should all citizens know about computing and how do we provide that knowledge. The questions being asked are about public policy, but also about what does it mean to be expressive with computation and what should computing users know. The answers to these questions have implications for the future of human-centric computing. I. Our Job: The first computer scientists set the goal to achieve a Computing-Literate Society. 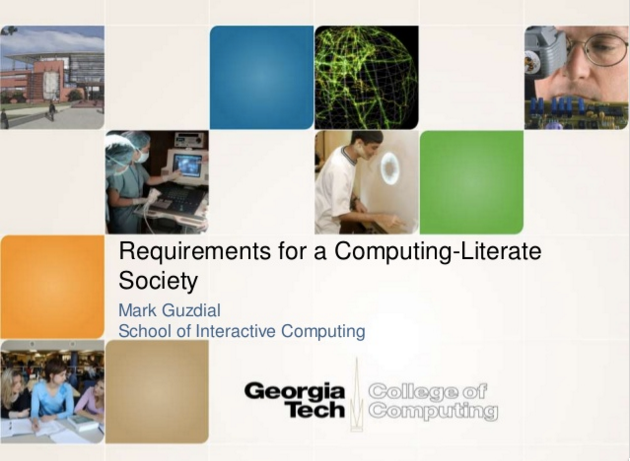 Story #1: Contextualized Computing Education. Story #2: Understanding the Needs of High School CS Teachers.